Phil Ochs: The Life and Legacy of a Legendary American Folk Singer | Democracy Now! director of Phil Ochs: There But for Fortune. In April 1976, less than a year after organizing a massive concert in New York’s Central Park to mark the end of the Vietnam War, Ochs took his own life. He had struggled with alcoholism and bipolar disorder that consumed his final years. He was 35 years old. AMY GOODMAN: Well, a new documentary has just been released chronicling Phil Ochs’ life. It’s called Phil Ochs: There But for Fortune, premiered at New York’s IFC Center last night. 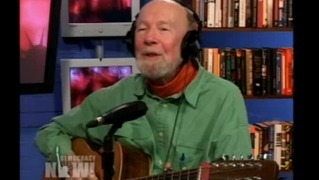 This clip from the film features a number of speakers, including Phil Ochs. It begins with Ochs’ producer, the musician and arranger Van Dyke Parks. VAN DYKE PARKS: Thing about Phil that made him interesting was he was totally unequivocal. He was determined, precise, literate, but already filled with rage and political purpose in his songs. DAVE VAN RONK: Topical song movement evolved out of opposition to segregation, Jim Crow, and the civil rights movement, in general, subsequently the Vietnam War. Without those howling injustices and outrages, there would have been no protest song movement. Probably there would have been no folk song movement. PHIL OCHS: [singing] And then there came the boycotts and then the Freedom Rides. And forgetting what you stood for, you tried to block the tide. Oh, the automation bosses were laughing on the side, as they watched you lose your link on the chain, on the chain, as they watched you lose your link on the chain. MICHAEL OCHS: Phil would play anywhere. There were the club things. There’d be a multi-artist thing. You’d hear about all these causes that needed help. He would go to the South and do civil rights things. PHIL OCHS: [singing] If you drag her muddy rivers, nameless bodies you will find. Oh, the calendar is lying when it reads the present time. Oh, here’s to the land you’ve torn out the heart of. Mississippi, find yourself another country to be part of. MICHAEL OCHS: It was a great way to reach people through one’s music. Phil would actually turn down a commercial job for a benefit, because the benefit would usually reach more people. ABBIE HOFFMAN: No matter how small a group or big the group, whenever anybody asked, I can never remember him turning down anybody, any benefit, any chance to sing for a cause he believed in. He really — Phil Ochs was there. LUCIAN TRUSCOTT IV: Those guys were true believers. Those guys would show up, you know, for the opening of an envelope to give $10 to some guy that was handing out crackers on the Bowery, to sing a song for the cracker-hander-outter guy. ARTHUR GORSON: Phil went down to Hazard, Kentucky, because there was a miners’ strike. PHIL OCHS: [singing] Well, some people think that unions are too strong, union leaders should go back where they belong. ARTHUR GORSON: We got to sleep in bathtubs, so that when they came and shot up the rooms at night, you wouldn’t have bullets bouncing off. And it was cool. PHIL OCHS: [singing] Well, mining is a hazard in Hazard, Kentucky, and if you ain’t mining there, you’re awful lucky, because if you don’t get silicosis or a pay that’s just atrocious, you’ll be screaming for a union that will care. ARTHUR GORSON: There was sort of a very kind of practical moral politics that had to do with a sincere feeling that people should be treated equally. PHIL OCHS: [singing] But if you want to get together and fight, good buddy, that’s what I want to hear. REV. DR. MARTIN LUTHER KING, JR.: Let us save our national honor. Stop the bombing, and stop the war. PHIL OCHS: I mean, I’m a young man, and the government wants to ask me to go over there and die, possibly, or to kill, for doubtful reasons. And I say, nonsense. Absolute nonsense. CORA WEISS: The whole draft was totally unjust. Rich kids, college kids got out. Poor kids, black kids, poor white kids were drafted. PHIL OCHS: [singing] That someone’s gotta go over there, and that someone isn’t me. So I wish you well, Sarge, give 'em hell. Kill me a thousand or so. And if you ever get a war without blood and gore, I'll be the first to go. CORA WEISS: There was a resistance movement that developed, because people felt it was not a just war and they didn’t want to fight. And that’s what Phil sang about. PHIL OCHS: [singing] Oh, I marched to the Battle of New Orleans at the end of the early British war. The young land started growing, the young blood started flowing, but I ain’t a-marching anymore. MICHAEL OCHS: The second album was I Ain’t Marching Anymore. He’s much more confident as a singer, more confident as a guitarist. PHIL OCHS: [singing] It’s always the old who lead us to the war, always the young to fall. Now look at all we’ve won with the saber and the gun. Tell me, is it worth it all? MICHAEL OCHS: The Hamlet of that album is the title song, “I Ain’t Marching Anymore,” which became the anthem of the antiwar movement. PHIL OCHS: The war that was bound to end all wars. Oh, I must have killed a million men, and now they want me back again, but I ain’t a-marching anymore. LUCIAN TRUSCOTT IV: The Army didn’t get us into Vietnam. And I think Phil understood that. Politicians get you into wars, and military people die. The rest of the sort of New York scene wouldn’t really talk out loud like that. He understood all those things. He was willing to say things like that. PHIL OCHS: Having American community, you have varying shades of political opinion. One of the shadiest of these is the liberals — 10 degrees to the left of center in good times, 10 degrees to the right of center if it affects them personally. [singing] I cried when they shot Medgar Evers. Tears ran down my spine. And I cried when they shot Mr. Kennedy, as though I’d lost a father of mine. But Malcolm X got what was coming. He got what he asked for this time. So, love me, love me, love me, I’m a liberal. Get it? AMY GOODMAN: Phil Ochs: There But for Fortune. The film opened at New York’s IFC Center last night here in New York, and we’re joined by, well, the film’s director Kenneth Bowser, and we’re joined by Phil Ochs’ brother, Michael Ochs. He’s among the many people interviewed in the film. Others include Sean Penn and Pete Seeger, Joan Baez and Tom Hayden. Abbie Hoffman is featured in the film. Jerry Rubin is in the film. AMY GOODMAN: — not that you had any experience doing this — seeing his life and working on this film? MICHAEL OCHS: It’s a pleasure to see Phil alive again. It’s a pleasure to see him espousing the same causes and in a totally different medium. And it’s a lot of years past the time. JUAN GONZALEZ: Ken Bowser, you’ve worked on this for many years, this film. You’ve called him the “broken heart” of the movement of his time. Could you explain what made you want to do this film and also that assessment of him? KENNETH BOWSER: I grew up listening to his songs. I saw him play at a benefit. I remember he came into play at a benefit for César Chávez, and it must have been ’70, ’71, 150 people. He had flown in from Los Angeles, and he probably lost money flying in to raise $200 or whatever it was. And I just — I loved his music. So, I just — I loved his music. I loved his work. I loved who the man was. And he conveyed to me his love of his country, and I hope I share that love. And so, it was all a story I wanted to tell. AMY GOODMAN: I wanted to go back to another clip of this remarkable film, tracking Phil’s activism, built around his famous song “The War is Over.” It features interviews with speakers — well, with Paul Krassner and with actor and director Sean Penn. PHIL OCHS: I got involved with the Politics of the Absurd in California, which was a theater demonstration in which we declared the war over in Vietnam. PAUL KRASSNER: Realities develop out of a fantasy. And it was a fantasy. The war is over, if you want it. PHIL OCHS: [singing] I declare the war is over. MICHAEL OCHS: LBJ was campaigning and doing a speech at Century City. And Phil organized a “War is Over” demonstration. And they do it outside the hotel where Johnson’s speaking, and the cops go crazy. PHIL OCHS: You spend years fighting against the war on a moral basis. And the administration doesn’t listen at all, you know, and you become increasingly aware that you’re not having an effect. MICHAEL OCHS: Phil decided, let’s do it again in New York. PHIL OCHS: So it’ll be a theater piece. It’s not a hippie theater piece; it’s a theater piece. ABBIE HOFFMAN: And he ran around frantic. When he got onto an idea, he got as manic as most of the other creative artists that you know. And he designed posters, and he got the World War II poster of the sailor kissing the girl. We were going to make it a reality. And we all gathered in Washington Square Park, and he sang the song. PHIL OCHS: [singing] Trust your leaders, where mistakes are almost never made, and they’re afraid that I’m afraid, I’m afraid the war is over. It’s over. ABBIE HOFFMAN: About 5,000 people just went streaming up the boulevards, hugging people, “The war is over! The war is over!” And it was quite effective, because in that moment, they had to say, well, what would it be like if it was over? PAUL KRASSNER: We ran through the streets against traffic, so it was hard for the cops to follow us. We had noisemakers and shouting, “The war is over!” And a lot of people believed it. PHIL OCHS: I think America has to wake up to the absurdity that it is involved with. And I think street theater like that, you know, is not going to end the war. I mean, none of the things have ended the war. But I think it’s more effective theatrically in getting the absurdity across to these people. [singing] So do your duty, boys, and join with pride. Serve your country in her suicide. Find a flag so you can wave goodbye. But just before the end, even treason might be worth a try. This country is too young to die. I believe the war is over. AMY GOODMAN: Phil Ochs singing “The War is Over.” Ah, they hoped in 1967. But, of course, the images going across the screen are the war in Vietnam, full-blown. I think many people thought it was John Lennon and Yoko Ono who created this idea of “The war is over. Believe it, and it will happen.” But it came from Phil? MICHAEL OCHS: Yeah, Phil told me, Allen Ginsberg came up with the idea first. They were talking, and Phil loved the idea, so Phil actually effectuated it. MICHAEL OCHS: It was more than a dream. It was political theater. It was the idea, if we do this, to get people to think: what would this be like if it really were over? And people — people bought it. I mean, people were cheering and throwing things, until they realized it was a joke. AMY GOODMAN: So you have Vietnam. Then you have Chile, which Phil got very involved with, the U.S.-backed Pinochet regime rising to power. This clip in the film addresses Phil Ochs’ effort to inform the U.S. public on the Nixon administration’s support for the ’73 military coup in Chile. Phil Ochs had previously traveled to Chile and befriended the folk singer Víctor Jara, who was slain by military forces during the coup. Phil convinced Bob Dylan to co-headline a benefit concert for Chilean refugees. LOLA COHEN: Bob came over to the apartment, and we were downstairs in that bunker. And Phil had Salvador Allende’s inauguration speech, his inaugural address. And he read it. And it was just — we were just blown away, and we were silent. And it was very — you know, very moving. And he told us about Víctor Jara and that he had to do this to avenge Víctor’s death for his wife and child. DENI FRAND: And he finally got Dylan to say that he will probably come. And, of course, we saw that. PHIL OCHS: Hold it. What we’re trying to do here is an experiment in aesthetics in politics, regarding [inaudible]. The mere fact of you yelling more is part of the [inaudible] fan worship. ARTHUR GORSON: That concert was the first time that people got up in public and said that the CIA was behind the overthrow of Salvador Allende. AMY GOODMAN: A clip of the film Phil Ochs: There But for Fortune. Phil, though, as his singing was remarkable, was declining. Michael, in this last minute, those last years of his life? MICHAEL OCHS: Yes, he was having trouble writing songs, and so he became much more political by organizing more and more demonstrations, like the Chile demonstration. AMY GOODMAN: And talk about what happened at the young age of 35. MICHAEL OCHS: Basically, Phil was a manic depressive. And the manic binge he went on, probably out of desperation, frustration, etc., he went too far, and he never got back. He became, as we do, we get depressed afterwards, and he couldn’t see the next mountain due to the valley he was stuck in. And we tried to get him help. And he finally went to a shrink, but then, a week later, he killed himself. AMY GOODMAN: I was very touched last night when you said he told you he would commit suicide many times, and at the time you thought that meant he wouldn’t, that if you said it, you wouldn’t. MICHAEL OCHS: Yeah, yeah. And it’s throughout the lyrics of his songs in the last two, if not three, albums. I mean, the suicide sub-theme runs throughout. AMY GOODMAN: But it is a myth. If you say it, it has to be taken seriously. MICHAEL OCHS: It is a myth, yeah. If they talk about it, you best believe, take it seriously. AMY GOODMAN: Well, Michael Ochs and Ken Bowser, a remarkable film. It’s called Phil Ochs: There But for Fortune. It’s opened in New York and hopefully will travel this country.